Edict of March 11, 1812. Capital of Prussia and of the German empire. Though mentioned as early as the year 1225, it was an unimportant place during the whole of the Middle Ages. Not much is known of the Jews there during that period, yet there is enough to show that they shared the same fate as their coreligionists of that time in other cities and countries. At the beginning of the fourteenth century the "Reichsgräfin" (countess of the empire) Agnes presented the Jews of Berlin to the magistrate. They were expelled during the Black Death, and their synagogue was given to a Christian citizen (1350); but in accordance with the spirit of the Middle Ages they were allowed to return in 1354. They were not, however, permitted to have a public synagogue, but had to content themselves for a number of years with worshiping in private houses. There is no further mention of the Jews until the beginning of the sixteenth century. In 1509 the Jews of the neighboring Bernau were accused of desecrating the host, and thirty-eight of them, alleged to have committed the crime, were publicly burned by order of the elector Joachim I. (July 19, 1510). Only two accepted baptism, and these were beheaded, the sentence of death at the stake having been commuted to this as "an act of grace." As the usual consequence of such occurrences, the Jews generally were expelled: but they apparently were received again within a very short time, for in the fourth decadeof that century the magistrate again complained of them. About the same time, the court Jew Lippold, favorite of the elector Joachim II., became especially important, he having been entrusted by the latter with the superintendence of all Jewish affairs. When Joachim died suddenly (1571), his successor, Johann Georg, accused Lippold of having murdered the elector. Lippold's admissions on the rack, and the books on magic found in his possession, furnished to his enemies sufficient evidence to procure his condemnation and execution (Jan. 28, 1573). Again an expulsion of the Jews followed. The real history of the Jewish community of Berlin does not begin until the year 1671. When the Jews were expelled (1670) from Vienna, under Emperor Leopold I., the great elector, who previously had shown his unprejudiced attitude toward the Jews by admitting two Jewish students to the University of Frankfort-on-the-Oder (see under Cohn, Tobias), signified his willingness to receive a number of Jewish families into his dominions, and ordered his resident at Vienna, Andreas Neumann, to open negotiations with the Jews of that city. The edict of admission was published May 21, 1671. The emigrants could freely engage in commerce; but usury was forbidden. They were exempt from tolls in traveling, but had to pay a yearly protection tax of eight thalers per family, and one gold florin for every marriage. In civil cases they were to be judged by the mayor, in criminal cases by the elector. They were not permitted to have a public synagogue. These privileges were at first granted for a period of twenty years. A few months later the Austrian fugitives arrived at Berlin and went to their quarters near the city walls. As the court Jew Israel Aaron was afraid of the competition of the immigrants, he succeeded in having a decree issued, Sept. 6, 1671, under which no Jews would be received in Berlin except after a careful investigation into their financial condition. Instead of the anticipated number of letters of protection, one common writ of privileges was issued to the Veit and Riess families, in which they were expressly forbidden to compete with Aaron. 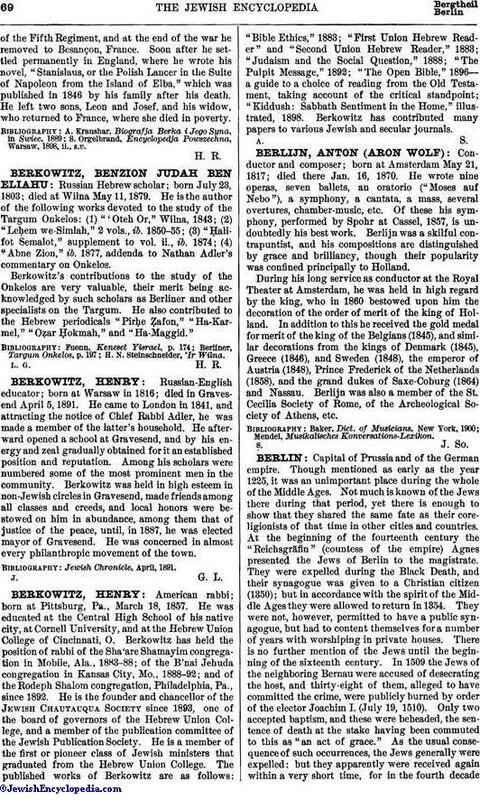 That day (Sept. 10, 1671) is the birthday of the Jewish community of Berlin. In 1672 a cemetery was bought for the new community, and in 1676 a burial society was founded under the name "Gemiluss Chassodim." The fear of competition forced the new immigrants to protect themselves against the influx of other Jews, whom they attempted to keep away by threats of excommunication. Though they were forbidden to put this measure into force, the authorities agreed to come to them for information concerning every new immigrant, the signers to such a reference being then held responsible for the person named. This measure did not prevent many "unvergleitete Juden" (Jews having no "Geleitsbrief," or residence permit) from entering Berlin surreptitiously, thus furnishing cause for endless legislation in the electorate of Brandenburg; and the evil was not wholly remedied even by stringent measures. The great elector faithfully kept his promise to protect the Jews. On Jan. 3, 1676, a decree was issued in which occurred the following: "die Juden in Berlin in ihren Freyheiten und Privilegien nicht zu turbiren, noch zu kränken, sondern sie vielmehr dabey gebürend zu schützen" (not to disturb or worry the Jews of Berlin in their grants and privileges, but to protect them properly). But when, nine years later, an accuser, Bendix Levi, rose out of the midst of the Jews themselves, making the most violent accusations against them, he gained the ear of the great elector, who ordered that every Jew should give bonds to the amount of 1,000 thalers (Sept. 8, 1685). Exterior of the Old Synagogue, Berlin. The great elector died in 1688, and was succeeded by the elector Frederick III., who became king of Prussia Jan. 18, 1701. Even in swearing to the coronation oath the council brought up complaints against the Jews. As the twenty years for which the privileges of 1671 were granted were drawing to a close, Frederick instituted a commission to examine the letters of protection (May, 1688), before which every Jew had to appear, and to receive confirmation of his privileges on payment of a certain tax. Most stringent measures were taken against the "unvergleitete Juden," but all to no avail. A special commission was instituted to determine the rights of the Jews (Jan. 24, 1700). The number of Jewish families for the whole electorate was fixed at fifty. Instead of the personal protection-tax (eight thalers), the whole community was taxed in a yearly sum of 3,000 thalers; and a poll-tax was instituted. Another decree was issued (Dec. 7, 1700), which revoked the poll-tax, fixed the protection-money at 1,000 ducats, and placed some restrictions upon commerce. At the request of the shopkeepers'gild, for instance, Jews were forbidden to keep public shops and stalls. A report on the execution of this measure, however, says: "Ist leyder nicht cin Buchstabe von dieser heylsamen Verordnung in Acht genommen worden" (Unfortunately not a jot of this wholesome measure received any heed). Other restrictions followed. Peddling had been forbidden (Aug. 17, 1692), and now also living in villages (Oct. 16, 1706). Aversion to the Jews began to show itself also in other matters. Franz Wentzel brought forward the accusation that the Jews during the 'Alenu prayer jumped up and spat in derision of Jesus. In consequence a severe edict was issued against the prayer in September of the year 1700. An investigation was instituted, to which delegates of the Jews were called, and as a result there was issued, Aug. 28, 1703, the "Edict wegen des Judengebeths 'Alenu, und das sie einige Worte auslassen, nicht ausspeyen, noch darbey hinweg-springen sollen" (Edict concerning the Jews' prayer 'Alenu, and that they shall leave out some words, shall not spit nor jump up during its recital). This decree was often renewed. According to it the prayer was allowed only to be said in the synagogue and in a loud voice; and a Christian official was appointed to see that this injunction was carried out. It was only after many years that the degree was revoked, at the instance of Moses Mendelssohn. About the same time appeared Johann Andreas Eisenmenger's book, "Das Entdeckte Judenthum" (Frankfort-on-the-Main, 1700). Owing to the efforts of the Jews the book was forbidden by Emperor Leopold I., and continued under that ban, in spite of the repeated objections of the Prussian king Frederick I., who thereupon had it reprinted at Berlin in 1711. Interior of the Old Synagogue, Berlin. In 1708 a standing commission (which had charge of Jewish affairs until 1750) was instituted, the Jews themselves taking only a very small part in their own government. The "elders"—most of whom were chosen by the community for a period of three years, subject to confirmation by the government, though some were nominated for life—supervised mainly the collection of the taxes and the carrying out of the regulations pertaining thereto. Among the elders at the beginning of the eighteenth century were Jost Liebmann and Marcus Magnus. Personal enmity between these two grew into a communal quarrel which divided the Jews into two camps and was attended with dire results. Liebmann, who married the widow of Israel Aaron, succeeded the latter in his position at court also, and acquired a large fortune by furnishing diamonds. After Aaron's death the appointment was conferred upon his widow. She gained the favor of the king, who placed her in a position entirely independent of the Jewish community, signifying his esteem by presenting her with a gold chain. While, however, the Liebmann family enjoyed the favor of the king, Magnus was the special favorite of the crown prince. The latent disharmony between the two families became apparent at a trifling occurrence during worship, Marcus Magnus insisting that Liebmann had offended him. A bitter lawsuit resulted which lasted for two years, and was ended only by a royal order (May 7, 1710) commanding both parties, under pain of heavy punishment, to meet henceforth peacefully and quietly ("bey Vermeidung ernster Bestrafung hinführo friedtlich und ruhig sich zu begegnen"). The quarrel, however, soon became a communal matter, occasion for dispute being found in the conditions of worship. It has already been mentioned that the Jews had never been permitted to have a public synagogue, the services being held in private houses. One of these was in the house of Veit and Riess. But Liebmann also insisted on having a synagogue and a bet ha-midrash; and his nephew and son-in-law, Aaron Benjamin Wolf, wasappointed rabbi. 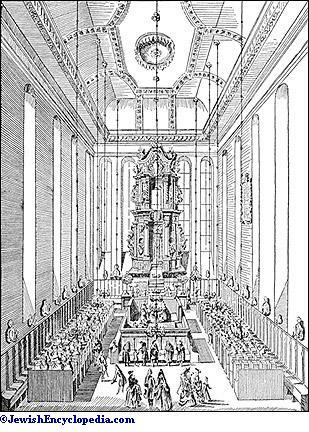 In 1684 Liebmann's synagogue was declared to be the only official one. 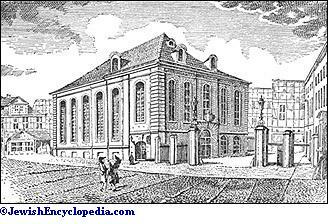 Nevertheless, the synagogue of Veit and Riess continued, and in 1694 was even officially recognized. In order to prevent the undesirable consequences of such a split, and more especially to injure Liebmann's widow, Marcus Magnus insisted on the necessity of a common public synagogue. 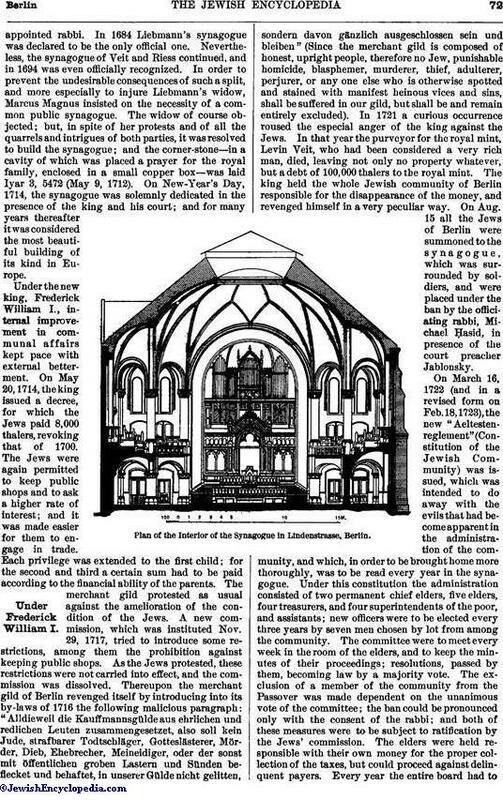 The widow of course objected; but, in spite of her protests and of all the quarrels and intrigues of both parties, it was resolved to build the synagogue; and the corner-stone—in a cavity of which was placed a prayer for the royal family, enclosed in a small copper box—was laid Iyar 3, 5472 (May 9, 1712). 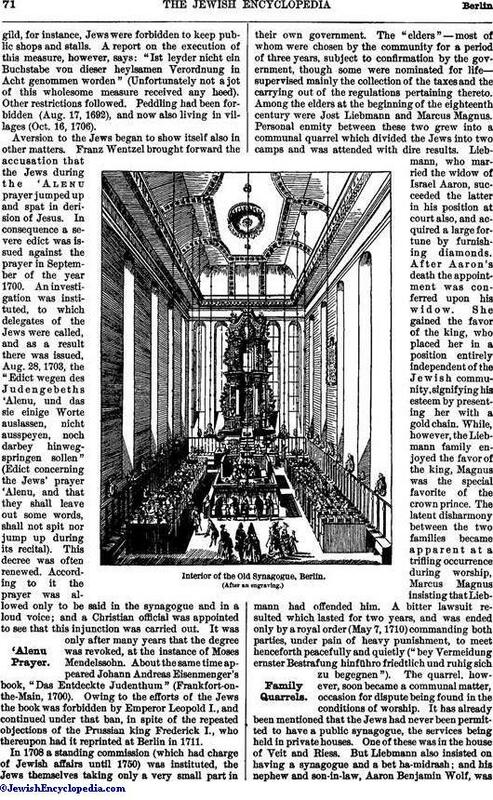 On New-Year's Day, 1714, the synagogue was solemnly dedicated in the presence of the king and his court; and for many years thereafter it was considered the most beautiful building of its kind in Europe. Under the new king, Frederick William I., internal improvement in communal affairs kept pace with external betterment. On May 20, 1714, the king issued a decree, for which the Jews paid 8,000 thalers, revoking that of 1700. The Jews were again permitted to keep public shops and to ask a higher rate of interest; and it was made easier for them to engage in trade. Each privilege was extended to the first child; for the second and third a certain sum had to be paid according to the financial ability of the parents. The merchant gild protested as usual against the amelioration of the condition of the Jews. A new commission, which was instituted Nov. 29, 1717, tried to introduce some restrictions, among them the prohibition against keeping public shops. As the Jews protested, these restrictions were not carried into effect, and the commission was dissolved. Thereupon the merchant gild of Berlin revenged itself by introducing into its by-laws of 1716 the following malicious paragraph: "Alldieweil die Kauffmannsgülde aus chrlichen und redlichen Leuten zusammengesetzet, also soll kein Jude, strafbarer Todtschläger, Gotteslästerer, Mörder, Dieb, Ehebrecher, Meineidiger, oder der sonst mit öffentlichen groben Lastern und Sünden beflecket und behaftet, in unserer Gülde nicht gelitten, sondern davon gänzlich ausgeschlossen sein und bleiben" (Since the merchant gild is composed of honest, upright people, therefore no Jew, punishable homicide, blasphemer, murderer, thief, adulterer, perjurer, or any one else who is otherwise spotted and stained with manifest heinous vices and sins, shall be suffered in our gild, but shall be and remain entirely excluded). In 1721 a curious occurrence roused the especial anger of the king against the Jews. In that year the purveyor for the royal mint, Levin Veit, who had been considered a very rich man, died, leaving not only no property whatever, but a debt of 100,000 thalers to the royal mint. The king held the whole Jewish community of Berlin responsible for the disappearance of the money, and revenged himself in a very peculiar way. 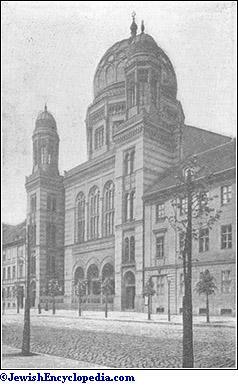 On Aug. 15 all the Jews of Berlin were summoned to the synagogue, which was surrounded by soldiers, and were placed under the ban by the officiating rabbi, Michael Ḥasid, in presence of the court preacher Jablonsky. 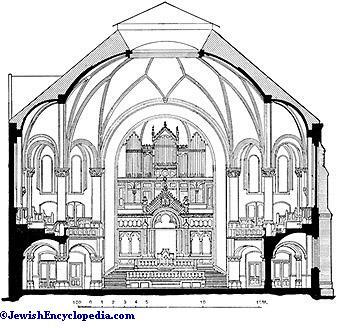 Plan of the Interior of the Synagogue in Lindenstrasse, Berlin. On March 16, 1722 (and in a revised form on Feb. 18, 1723), the new "Aeltesten-reglement" (Constitution of the Jewish Community) was issued, which was intended to do away with the evils that had become apparent in the administration of the community, and which, in order to be brought home more thoroughly, was to be read every year in the synagogue. Under this constitution the administration consisted of two permanent chief elders, five elders, four treasurers, and four superintendents of the poor, and assistants; new officers were to be elected every three years by seven men chosen by lot from among the community. The committee were to meet every week in the room of the elders, and to keep the minutes of their proceedings; resolutions, passed by them, becoming law by a majority vote. The exclusion of a member of the community from the Passover was made dependent on the unanimous vote of the committee; the ban could be pronounced only with the consent of the rabbi; and both of these measures were to be subject to ratification by the Jews' commission. The elders were held responsible with their own money for the proper collection of the taxes, but could proceed against delinquent payers. Every year the entire board had toreport to a committee of five chosen by the community. The college of rabbis was to consist of a chief rabbi, with the title , a vice rabbi ( ), and two or three assessors. Other taxes were soon added to the existing ones; e.g., on pawnshops, and calendar money for the Royal Society of Science, and marriage licenses. The income from the last was paid into the treasury from which enlisted men received their pay, and its amount (4,800 thalers a year) soon became a permanent tax upon the whole community. A new decree was contemplated in 1727, to contain various restrictions on trade and commerce; but as the Jews protested against it, it was abandoned. After lengthy discussions with them there appeared, Sept. 29, 1730, the "Generalprivilegium und Reglement, wie es wegen der Juden in seiner Königlichen Majestät Landen zu halten" (General privilege and regulations to be observed concerning the Jews in his Majesty's dominions). The number of Jewish families in Berlin was limited to 120, but they soon numbered 180. A royal order that appeared suddenly, April 26, 1737, commanded the families in excess to depart; the king insisting on the measure in spite of all the protests of the unfortunate ones and of some of the authorities. He even declared that he would rather lose the remaining Jewish families together with their yearly tax of 20,000 thalers than permit the ruinous oppression of his subjects. The precarious condition of the Jews appeared also in other directions. When the soldiers complained of the filthy barracks that had been assigned to them, the Jews were forced to give up to them their own rented houses and to move into the barracks at a rental arbitrarily fixed by the authorities (Oct., 1737). In the same year the electoral chamber passed new regulations for the Jews of Berlin, which contained more stringent measures, having in view the gradual diminution and ultimate extinction of the community; the death of Frederick William I. (May 31, 1740) prevented their being put into execution. The condition of the Jews was not improved under his successor, Frederick the Great (1740-86); indeed, in many respects it grew worse. The "philosopher on the throne" showed, even then, that a philosophical and liberal view of the world is not a sufficient protection against prejudice, when Jews are in question. In 1747 he limited the right of residence to one child of every family, and decreed that every Jew who became bankrupt should lose his right to protection. An attempt to determine the rights of the Jews in general was undertaken on the advice of the fiscal-general Uhden. The Jews were divided into "ordinary" and "extraordinary" Jews. The former after death could be succeeded in their rights and privileges by their first-born child (either son or daughter); the remaining children, like the extraordinary Jews in general, enjoying the right of protection for themselves only, and being prohibited from registering their children. A law was passed embodying these conditions, but when it was about to go into effect (1750), the Jews, dissatisfied with it, and fearing that the restrictions therein contained would ruin their credit with other countries, prayed that it might not be made public; and in fact it was not published until six years later. In order to stimulate manufacturing in his dominions, Frederick the Great tried by various and even forcible means to press the Jews into the industries. As he disliked any increase of the Jews, either by birth or by immigration, he decreed (Oct. 29, 1757) that no Jews should receive new privileges, unless they promised to start factories. On the same condition they were each permitted to register an additional child. In general, the king looked upon the Jews merely as a source of income, and imposed taxes in various ways. For instance, they had to furnish silver amounting to 8,100 marks a year; and the protection-money was increased from 15,000 to 25,000 thalers. More curious still was the so-called porcelain-tax, which obliged every Jew, when applying for any concession, to buy a certain amount of porcelain in the royal porcelain-factory, and to sell it beyond the frontier. As the cost of transportation was very large compared with the value of the goods, such transactions involved considerable loss. The king was especially strict in carrying out the principle of communal responsibility, holding the elders pecuniarily liable for any theft committed by a member of the community. The first case of this kind occurred in 1769, when the king decided that the law must be upheld, in spite of the protests of the elders and the entreaty of the directory-general ("Generaldirectorium"). In 1784 this communal responsibility of the elders was extended to cases of bankruptcy of members of the community. Thus the philosophic king endeavored by extreme measures to turn the Jews of his country into pariahs. While these medieval measures still fettered the Jews externally, a movement was in progress that in an incredibly short time was to change their whole life and character and to prove once more that in the history of the Jews spiritual influences are more potent than brute force. Their regeneration came through German literature, which at that time began to flourish anew. In spite of its seclusion the Jewish ghetto also felt the breath of the fresh currents that revivified the intellectual life of Germany. Even before Mendelssohn, Aaron Salomon Gumpertz appeared, devoting himself to the sciences, and being one of the first Jews to receive a doctor's degree. But the real representative of this period is Moses Mendelssohn (1729-86). He modestly sought admission at the gates of Berlin as a poor "Talmud baḥur," and within a short time counted the whole of the cultivated classes of Germany among his readers. His translation of the Bible, together with the regenerated Hebrew literature, was pressed into the service of the new illumination. Actuated by the same spirit, David Friedländer and Isaac Daniel Itzig founded a free school, under the name , and, in connection with it, a Hebrew printing-establishment and book-store. German Judaism was entirely transformed as if by magic. Not so long before, a Jew who had dared to trim his beard had, at the instigation of aneminent member of the community, been commanded by a direct order of the cabinet to spare his locks; and the progenitor of the Bleichröder family had been driven from Berlin because a German book had been found in his possession. Now, the Jews were in the front rank of the promoters of German culture. The Berlin physician Markus Herz was an eager apostle of the philosophy of his teacher Kant, with whom he stood in close personal relations; and the lectures on physics, which he delivered at his house, were attended by the minister Zedlitz, and even by the crown prince. The salon of his wife, Henriette Herz, became the center of attraction for the most brilliant people of Germany, and for many of those of other continental countries. With the increase of enthusiasm for German culture, the indifference to and neglect of the religion of the Fathers increased also. While Mendelssohn himself and his circle still clung to their Judaism, even in the midst of the new movement, the younger generation tried to get rid of it as quickly as possible. More than one-half of the Berlin community is reported to have been baptized within a short time. The elders strove in vain to stem this flight from Judaism by a law, which they were instrumental in having passed, to the effect that servants and children could be baptized only after producing the certified permission of their masters and parents respectively, and that strangers must be taken to their native places for the ceremony. In 1792 the Gesellschaft der Freunde, an association of "the high-thinking and liberal against orthodoxy and immorality," was formed. In 1799 appeared the circular letter addressed to the "Very Reverend Chief Councilor of the Consistory and Provost [Probst] Teller at Berlin by some heads of families of the Jewish religion," in which the anonymous author (David Friedländer) signified willingness, in his own name and that of others, to be baptized, if they would not be obliged thereby to believe in the specifically Christian dogmas. Teller emphatically refused his request. The new generation was keenly sensitive to the lower civic status of the Jews. Hence all its efforts were united against the old general privilege, and in favor of emancipation, which had seemed to be more nearly within the reach of the Jews when Frederick William II. came to the throne (1786). 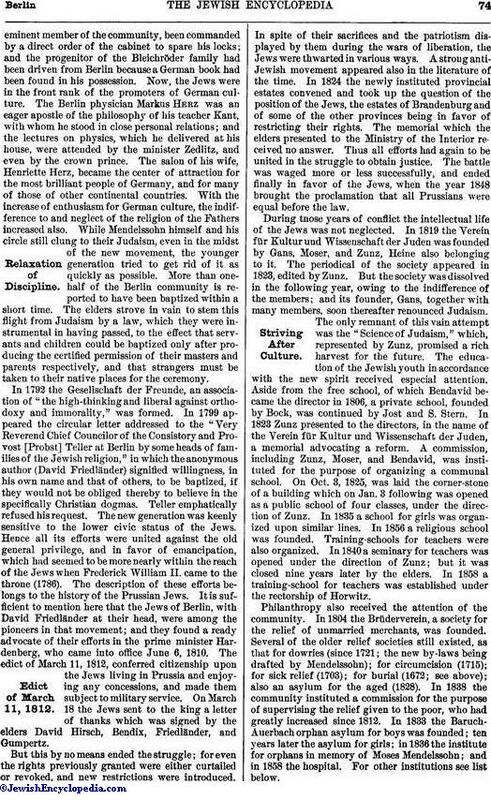 The description of these efforts belongs to the history of the Prussian Jews. It is sufficient to mention here that the Jews of Berlin, with David Friedländer at their head, were among the pioneers in that movement; and they found a ready advocate of their efforts in the prime minister Hardenberg, who came into office June 6, 1810. The edict of March 11, 1812, conferred citizenship upon the Jews living in Prussia and enjoying any concessions, and made them subject to military service. On March 18 the Jews sent to the king a letter of thanks which was signed by the elders David Hirsch, Bendix, Friedländer, and Gumpertz. But this by no means ended the struggle; for even the rights previously granted were either curtailed or revoked, and new restrictions were introduced. In spite of their sacrifices and the patriotism displayed by them during the wars of liberation, the Jews were thwarted in various ways. A strong anti-Jewish movement appeared also in the literature of the time. In 1824 the newly instituted provincial estates convened and took up the question of the position of the Jews, the estates of Brandenburg and of some of the other provinces being in favor of restricting their rights. The memorial which the elders presented to the Ministry of the Interior received no answer. Thus all efforts had again to be united in the struggle to obtain justice. The battle was waged more or less successfully, and ended finally in favor of the Jews, when the year 1848 brought the proclamation that all Prussians were equal before the law. During those years of conflict the intellectual life of the Jews was not neglected. In 1819 the Verein für Kultur und Wissenschaft der Juden was founded by Gans, Moser, and Zunz, Heine also belonging to it. The periodical of the society appeared in 1823, edited by Zunz. But the society was dissolved in the following year, owing to the indifference of the members; and its founder, Gans, together with many members, soon thereafter renounced Judaism. The only remnant of this vain attempt was the "Science of Judaism," which, represented by Zunz, promised a rich harvest for the future. The education of the Jewish youth in accordance with the new spirit received especial attention. Aside from the free school, of which Bendavid became the director in 1806, a private school, founded by Bock, was continued by Jost and S. Stern. In 1823 Zunz presented to the directors, in the name of the Verein für Kultur und Wissenschaft der Juden, a memorial advocating a reform. A commission, including Zunz, Moser, and Bendavid, was instituted for the purpose of organizing a communal school. On Oct. 3, 1825, was laid the corner-stone of a building which on Jan. 3 following was opened as a public school of four classes, under the direction of Zunz. In 1835 a school for girls was organized upon similar lines. In 1856 a religious school was founded. Training-schools for teachers were also organized. In 1840 a seminary for teachers was opened under the direction of Zunz; but it was closed nine years later by the elders. In 1858 a training-school for teachers was established under the rectorship of Horwitz. Philanthropy also received the attention of the community. In 1804 the Brüderverein, a society for the relief of unmarried merchants, was founded. Several of the older relief societies still existed, as that for dowries (since 1721; the new by-laws being drafted by Mendelssohn); for circumcision (1715); for sick relief (1703); for burial (1672; see above); also an asylum for the aged (1828). In 1838 the community instituted a commission for the purpose of supervising the relief given to the poor, who had greatly increased since 1812. In 1833 the Baruch-Auerbach orphan asylum for boys was founded; ten years later the asylum for girls; in 1836 the institute for orphans in memory of Moses Mendelssohn; and in 1858 the hospital. For other institutions see list below. The chief place in the inner development of the community is occupied by the struggle for ritual reform, in which both parties engaged with great bitterness. Shortly after the edict of 1812 Friedländer issued a pamphlet demanding reforms in the religious services, and sent it to the king, who gave an unfavorable answer, although the prime minister Hardenberg advocated Friedländer's propositions. The reforms were soon carried into effect, however; for the wealthy Jacob Herz Beer (the father of Meyerbeer) organized private services according to the new principles, at which Zunz also officiated as preacher. Israel Jacobsohn, the former president of the Westphalian consistory, imitating Beer's example, preached himself, and confirmed his son (Pentecost, 1815). But in 1817 there appeared a royal order which, falling back on the old "Generalprivilegium," commanded the closing of private synagogues. As the public synagogue was in need of repair, the temple of Beer was designated as a temporary synagogue. The Orthodox members, headed by their rabbi, Meyer Simon Weyl, protested against the order, and continued to worship in the half-completed synagogue. 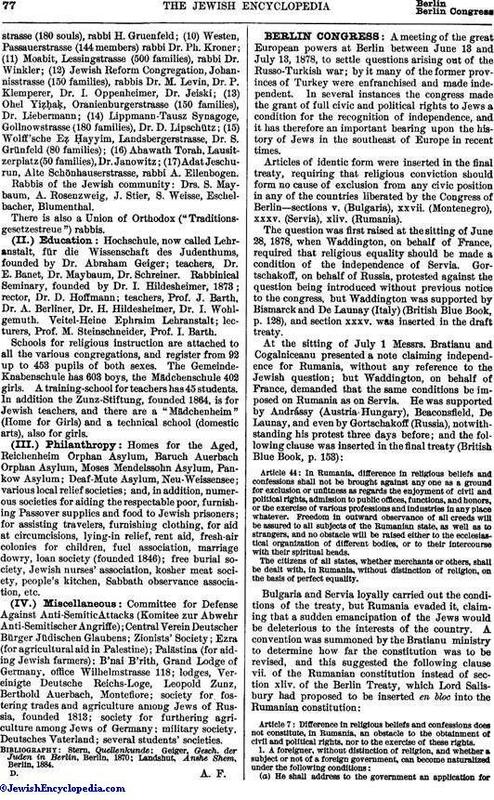 The government now decreed that the ancient Hebrew service should be followed by German prayers and a sermon in German; but at the instance of the Orthodox members a new royal order was issued, Dec. 9, 1823, to the effect "that the religious services of the Jews shall be held only in the present synagogue, and only according to the customary ritual, without the least innovation in the language or the ceremonial, the prayers and songs, entirely in accordance with the ancient custom." This regulation was so strictly carried out that when Rabbi Oettinger, at the dedication of the new cemetery in 1827, delivered an address in German, the police saw therein a forbidden innovation. Culture societies were organized in 1841 under the direction of Sigmund Stern, whose lectures in 1845 on the tasks of the Judaism of that time again stirred up the Reform movement. On March 10, 1845, a meeting was held under the leadership of Stern and A. Bernstein, which resolved "that rabbinic Judaism is on the whole and in its parts not in harmony with our scientific convictions and the demands of the present life." The Genossenschaft für Reform des Judenthums, founded in 1846, organized services under the leadership of its rabbi, Samuel Holdheim. These were held on Saturdays and Sundays (afterward only on Sundays), and their chief feature was the total exclusion of the Hebrew language. 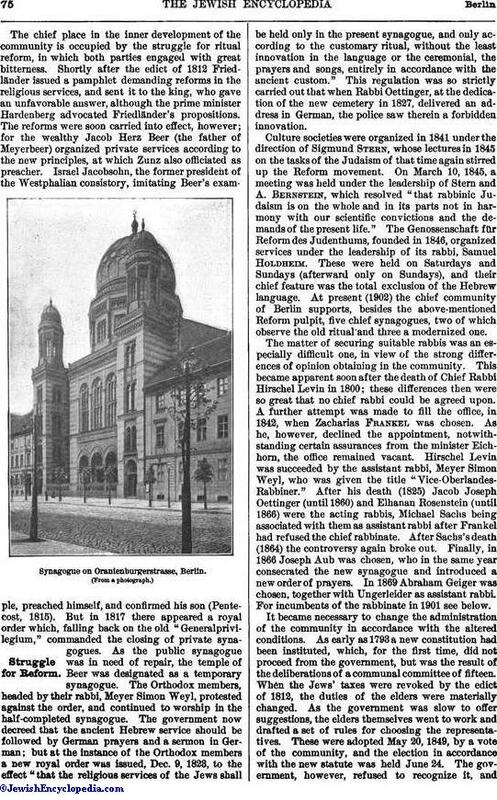 At present (1902) the chief community of Berlin supports, besides the above-mentioned Reform pulpit, five chief synagogues, two of which observe the old ritual and three a modernized one. The matter of securing suitable rabbis was an especially difficult one, in view of the strong differences of opinion obtaining in the community. This became apparent soon after the death of Chief Rabbi Hirschel Levin in 1800; these differences then were so great that no chief rabbi could be agreed upon. A further attempt was made to fill the office, in 1842, when Zacharias Frankel was chosen. As he, however, declined the appointment, notwithstanding certain assurances from the minister Eichhorn, the office remained vacant. Hirschel Levin was succeeded by the assistant rabbi, Meyer Simon Weyl, who was given the title "Vice-Oberlandes-Rabbiner." After his death (1825) Jacob Joseph Oettinger (until 1860) and Elhanan Rosenstein (until 1866) were the acting rabbis, Michael Sachs being associated with them as assistant rabbi after Frankel had refused the chief rabbinate. After Sachs's death (1864) the controversy again broke out. Finally, in 1866 Joseph Aub was chosen, who in the same year consecrated the new synagogue and introduced a new order of prayers. In 1869 Abraham Geiger was chosen, together with Ungerleider as assistant rabbi. For incumbents of the rabbinate in 1901 see below. It became necessary to change the administration of the community in accordance with the altered conditions. As early as 1793 a new constitution had been instituted, which, for the first time, did not proceed from the government, but was the result of the deliberations of a communal committee of fifteen. When the Jews' taxes were revoked by the edict of 1812, the duties of the elders were materially changed. As the government was slow to offer suggestions, the elders themselves went to work and drafted a set of rules for choosing the representatives. These were adopted May 20, 1849, by a vote of the community, and the election in accordance with the new statute was held June 24. The government, however, refused to recognize it, andordered a new election in accordance with the general regulations of 1750, which was held April 11, 1851. It was not till 1854 that the government recognized the new rules of 1849. On Feb. 23 of that year representatives were elected in accordance with those rules and were confirmed by the government. 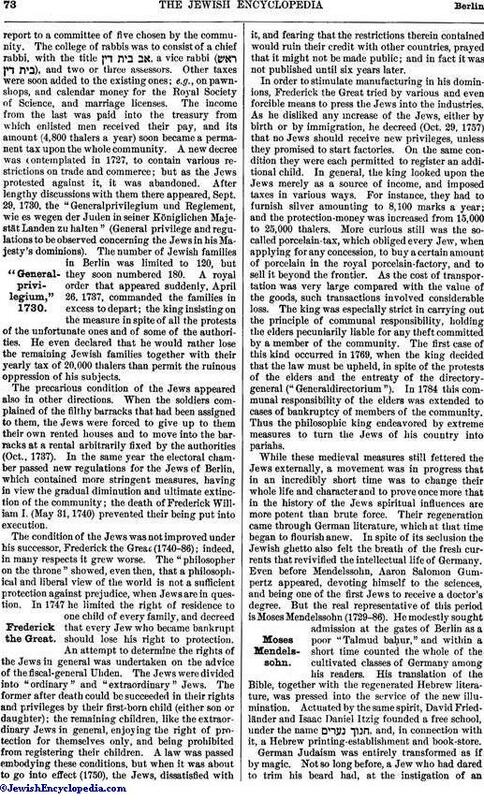 After much deliberation the "Statut für die Jüdische Gemeinde in Berlin" was determined upon (Aug. 31, 1860), which is still in force (1902). According to this statute the Jewish community of Berlin consists of all the Jews in that city and the neighboring places. The community is represented by a directorate and a college of representatives; the latter consisting of twenty-one members and fifteen substitutes, chosen every three years by a ballot of the whole community. The representatives choose the directorate, consisting of seven elders and three substitutes. The resolutions of the representatives are confirmed by the directorate. Differences are decided by a committee of the community or by the board of supervisors. Different branches of the administration are in the hands of special commissions, with a member of the directorate in the chair. The ministers, readers, and all officials who perform religious functions are chosen by a two-thirds majority of the representatives. (1) a certain Cain (meaning probably "Ḥayyim") as the first rabbi of the mark of Brandenburg, under whom the Jews emigrated from Vienna. His privilege for the whole electorate was issued Feb. 20, 1672. He probably did not live at Berlin, but at some other town of the mark, perhaps at Landsberg-on-the-Warthe. (2) Isaac Benjamin Wolf Liebmann succeeded Ḥayyim May 11, 1685. He lived at Landsberg-on-the-Warthe. (3) Shemaiah, called Simon Berend, appointed Aug. 23, 1687. He lived at first at Frankfort-on-the-Oder, then in Berlin; died on the last day of the Passover, 5469 (April 2, 1709). He was a high Talmudic authority. (4) Aaron Benjamin Wolf, son of Isaac Benjamin Wolf Liebmann, nephew and son-in-law of Jost Liebmann, 1709-21. (5) Michael Ḥasid, appointed May 17, 1714, who also succeeded to the rabbinate of Frankfort after Aaron Benjamin Wolf's death. (On the ban which Michael pronounced against the Jews of Berlin at the command of Frederick William I., see above.) His works have only partially been printed. He was considered a great Talmudist and also occupied himself with the Cabala, being called by the Jews the "great Cabalist." One of his sons embraced Catholicism, and became professor of Oriental languages at Vienna, under the name "Aloys Wiener von Sonnenfels." Michael Ḥasid died Feb. 21, 1728. During his rabbinate Marcus Abraham was chosen (1726) as the first rosh bet-din (director of the school-house), superintending as such the Talmudic instruction of the Jewish youths. (6) Moses Aaron of Lemberg, formerly rabbi in Leipnik. He was chosen contrary to the wishes of the community at the command of Frederick William I., who issued his order in spite of the protests of the elders. In consequence the new rabbi had violent quarrels with the community. The elders bought for the sum of 4,500 marks permission to choose another rabbi (May 27, 1730). Moses Aaron was forced to accept the rabbinate of Frankfort-on-the-Oder, with the condition to pay 300 marks a year to the rabbi of Berlin. From Frankfort he went to Nikolsburg, where he died, Ṭebet 17, 5518 (Dec. 28, 1757). (8) David Fränkel, who, having been born (1704) at Berlin and educated there, was especially acceptable to the community. Previously he had been chief rabbi at Dessau and at Frankfort-on-the-Oder. As he had many relations in Berlin over whom he could not, according to the law, exercise his office as judge, his brother-in-law, Veitel, agreed to pay a yearly sum for a substitute. Fränkel achieved fame by his commentary on Yerushalmi, and was the teacher of Moses Mendelssohn. He died suddenly Nisan 12, 5522 (April 5, 1762). (9) Aaron Hirsch, chosen 1763. Author of the "Minḥat Aharon." He went from Berlin to Schwabach in 1772, and died in 1780. His name "Aaron Mosessohn" was appended to the thanksgiving sermon written by Mendelssohn after the peace of Hubertusburg. (10) Hirschel Levin, called also Hirschel Löbel; elected 1772; died Aug. 26, 1800 (see Hirschel Levin). By the time of Levin's death the differences of opinion in the community had grown to be so great that it became impossible to have one central administration. The changes in the rabbi question since then have been mentioned above. The various activities of the Berlin Jewish community may best be summarized under the heads of (I.) worship, (II.) education, (III.) philanthropy, (IV.) miscellaneous. 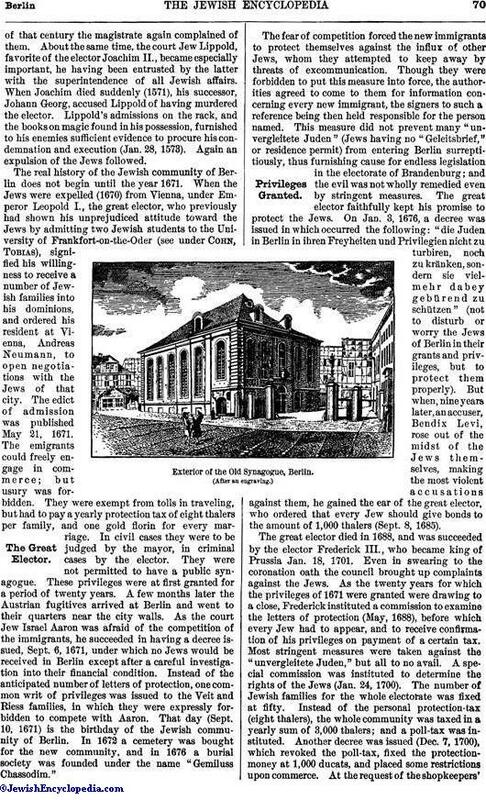 Berlin possesses the following synagogues and temples: (1) Alte Synagoge, Heidereutergasse; (2) Neue Synagoge, Oranienburgerstrasse; (3) synagogues in the Kaiserstrasse, Lindenstrasse, and Lützowstrasse; (4) Adas Yisroel, Gipsstrasse (314 families), rabbi Dr. Esra Munk, preacher Dr. M. Hildesheimer; (5) Schöneberger-Ufer, rabbi Dr. Petuchowski; (6) Ahawas Reïm, Prinzenstrasse (100 families), rabbi Dr. 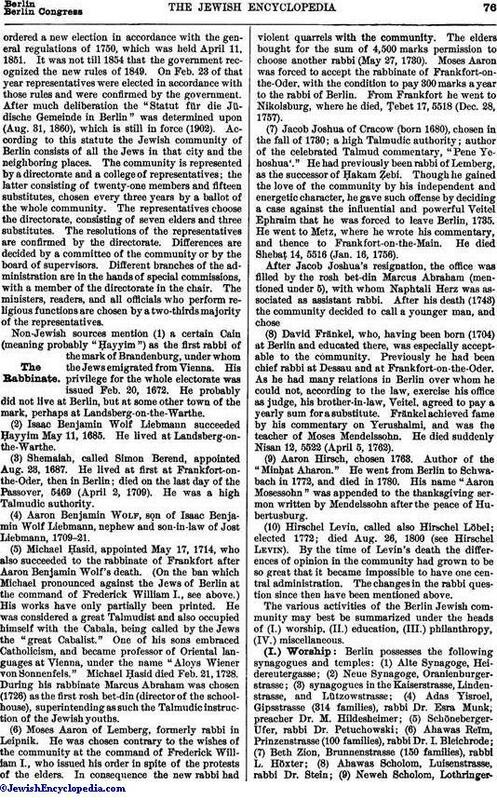 I. Bleichrode; (7) Beth Zion, Brunnenstrasse (150 families), rabbi L. Höxter; (8) Ahawas Scholom, Luisenstrasse, rabbi Dr. Stein; (9) Neweh Scholom, Lothringerstrasse(180 souls), rabbi H. Gruenfeld; (10) Westen, Passauerstrasse (144 members) rabbi Dr. Ph. Kroner; (11) Moabit, Lessingstrasse (500 families), rabbi Dr. Winkler; (12) Jewish Reform Congregation, Johannisstrasse (150 families), rabbis Dr. M. Levin, Dr. P. Klemperer, Dr. I. Oppenheimer, Dr. Jeiski; (13) Ohel Yiẓḥaḳ, Oranienburgerstrasse (150 families), Dr. Liebermann; (14) Lippmann-Tausz Synagoge, Gollnowstrasse (180 families), Dr. D. Lipschütz; (15) Wolff'sche Eẓ Ḥayyim, Landsbergerstrasse, Dr. S. Grünfeld (80 families); (16) Ahawath Torah, Lausitzerplatz (50 families), Dr. Janowitz; (17) Adat Jeschurun, Alte Schönhauserstrasse, rabbi A. Ellenbogen. Rabbis of the Jewish community: Drs. S. Maybaum, A. Rosenzweig, J. Stier, S. Weisse, Eschelbacher, Blumenthal. There is also a Union of Orthodox ("Traditions-gesetzestreue") rabbis. Hochschule, now called Lehranstalt, für die Wissenschaft des Judenthums, founded by Dr. Abraham Geiger; teachers, Dr. E. Banet, Dr. Maybaum, Dr. Schreiner. Rabbinical Seminary, founded by Dr. I. Hildesheimer, 1873; rector, Dr. D. Hoffmann; teachers, Prof. J. Barth, Dr. A. Berliner, Dr. H. Hildesheimer, Dr. I. Wohlgemuth. Veitel-Heine Ephraim Lehranstalt; lecturers, Prof. M. Steinschneider, Prof. I. Barth. Schools for religious instruction are attached to all the various congregations, and register from 92 up to 453 pupils of both sexes. The Gemeinde-Knabenschule has 603 boys, the Mädchenschule 402 girls. A training-school for teachers has 45 students. In addition the Zunz-Stiftung, founded 1864, is for Jewish teachers, and there are a "Mädchenheim" (Home for Girls) and a technical school (domestic arts), also for girls. Homes for the Aged, Reichenheim Orphan Asylum, Baruch Auerbach Orphan Asylum, Moses Mendelssohn Asylum, Pankow Asylum; Deaf-Mute Asylum, Neu-Weissensee; various local relief societies; and, in addition, numerous societies for aiding the respectable poor, furnishing Passover supplies and food to Jewish prisoners; for assisting travelers, furnishing clothing, for aid at circumcisions, lying-in relief, rent aid, fresh-air colonies for children, fuel association, marriage dowry, loan society (founded 1846); free burial society, Jewish nurses' association, kosher meat society, people's kitchen, Sabbath observance association, etc. Committee for Defense Against Anti-SemiticAttacks (Komitee zur Abwehr Anti-Semitischer Angriffe); Central Verein Deutscher Bürger Jüdischen Glaubens; Zionists' Society; Ezra (for agricultural aid in Palestine); Palästina (for aiding Jewish farmers); B'nai B'rith, Grand Lodge of Germany, office Wilhelmstrasse 118; lodges, Vereinigte Deutsche Reichs-Loge, Leopold Zunz, Berthold Auerbach, Montefiore; society for fostering trades and agriculture among Jews of Russia, founded 1813; society for furthering agriculture among Jews of Germany; military society, Deutsches Vaterland; several students' societies. Landshut, Anshe Shem, Berlin, 1884.